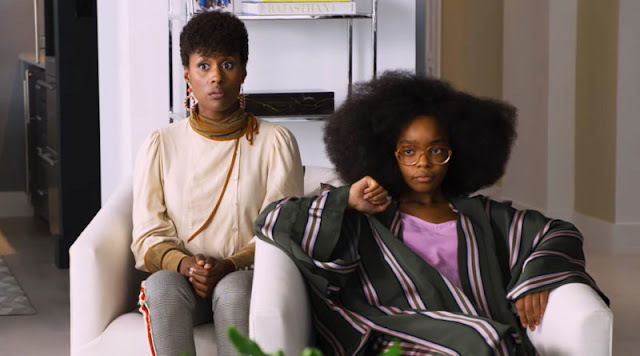 Hyde Park on Hudson, the latest effort from Roger Michell (Notting Hill), is a frustrating film with insurmountable issues. Few films in recent memory have annoyed me as much as this one did, especially since it had an abundance of potential. You’d think that the combination of a quirky take on an historical occasion, a competent director and a talented cast would ensure a satisfactory result, but sadly it doesn’t. Ultimately the result is a slapdash film which never really worked out what it wanted to be. I envisaged a light hearted comedy with farcical elements or perhaps, given the cast, a true battle of wordsmiths. Unfortunately I got neither. My only real concern is which knife I use to hack this film to death. 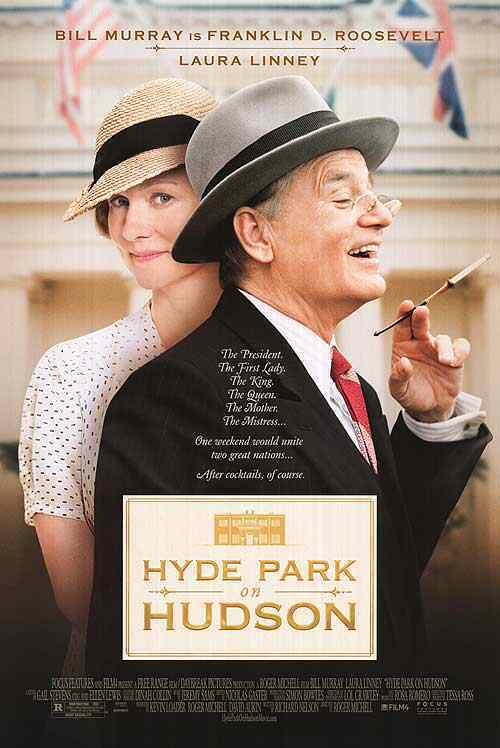 Set in 1939, Hyde Park on Hudson is about a love affair between President Roosevelt (Bill Murray) and his distant cousin Daisy (Laura Linney). The bulk of the film takes place on a weekend when King George VI (Samuel West) and Queen Elizabeth (Olivia Colman) are visiting America for the first time. I was instantly fascinated by the premise. It seemed like a charming story with a bit intrigue, gently poking fun at cross-Atlantic relations. But it never got off its backside to explore its own world. I was treated to a series of paper thin characters who roamed around, seemingly in their own film, occasionally acknowledging that there were other actors on screen. Even worse was the fact that the film was guilty of some of the most atrocious narration I have ever experienced. There is a very simple concept when it comes to filmmaking – show don’t tell! If I wanted someone to simply tell me the plot points I’d listen to a book-on-tape. So many scenes were destroyed by Laura Linney chiming in to explain everyone’s motivations as if she were talking to a five-year-old. Such heavy handed story telling is a guaranteed way to take me right out of the film. I wish the film makers could have showed some faith in the material – or the audience, for that matter. Samuel West and Olivia Colman are the only stand-outs in the acting department, albeit Mr West is only doing is his best Colin Firth impression, considering King George VI will forever be immortalised in Firth’s superb portrayal in The King’s Speech. Olivia Colman is delightful as ever, playing a graceful and touchingly insecure Queen Elizabeth. The rest of the cast leaves a lot to be desired. Bill Murray is basically sleepwalking through his role as President Roosevelt, and Laura Linney is worthy of far better material, and at the risk of sounding superficial, I cringed when her character Daisy was referred to as being a ‘pretty young thing’ by Eleanor Roosevelt (Olivia Williams). This made me think that the character was meant to be played by a younger actress, which brought unnecessary attention to Linney’s actual age. The tone of the film suffers because the majority of action centres on the affair between FDR and Daisy. The story therefore kept being dragged back to this relationship, much to the detriment of the more interesting story lines. This would be fine if the affair was compelling but I was struggling to see what either person was getting from the relationship, which, as you can imagine, just angered me further. There seemed little point in introducing so many different elements to the story if the film had no intention of using them. To make matters worse, the tone constantly shifted, preventing it from ever developing any real dramatic momentum. It jumped from farce to human drama to light-hearted romp to personal relationship tale, with even a few menacing scenes seemingly styled after The Blair Witch Project – the absurdity of which has to be seen to be believed. The comedy was never manic enough to be funny and the drama carried absolutely no weight. Being set in a mansion with a small army of support staff, the film dabbled with the idea of an upstairs/downstairs concept, in the vein of Gosford Park. This failed because the minor characters weren’t given time to establish their personalities. For the most part they were just meaningless background fodder. As I put away my butcher’s knife and wipe away the blood, I implore you to not waste your time or money on this film. Instead go watch the films that this one wanted to be, like Gosford Park or The King’s Speech. They are smarter films which will be remembered well after Hyde Park on Hudson has faded away. Hyde Park on Hudson hits cinemas on the 28th of March, if you see the film and agree or disagree with my review feel free to leave a comment below.